Just like older brother and sister, Patrick and Anne Burns Brown, John and Ellen Burns Brown also had a large family. So far we have looked at William Henry, David and James. In this post, we will look at more of the Brown children. Ann was just fifteen when her father died in 1873. She married Timothy (Tade) Murnane on April 1, 18752. This was two years after her father died and three years before the death of her mother. The two oldest children of Mary Ann and Timothy, John and Julia, were born before Ellen died; so, Ellen did get to see, at least, some of her grandchildren. (Ellen died just two weeks after Julia was born in 1878.) Mary Ann and Timothy eventually had a total of ten children: John, Julia, James Joseph, Ellen, Mary Clare, Grace, Nora Cecelia, Margaret, Timothy, and David. Mary Ann and Timothy set up housekeeping on Dublin Road near the stone quarry owned by Peter Burns in Franklin Township. Like, Mary Ann, Timothy was born in Ohio of Irish immigrant parents. While there was still much public bias against the Irish at this time, second generation Irish did assimilate into the “American” culture easier than their parents. There were still predominantly “Irish” sections of town, but, there were steadier employment opportunities allowing a more affluent lifestyle and better housing than the original immigrants experienced. In 1902 they moved to 133 N. Eureka Ave. in the “Hilltop” area where they lived the rest of their lives3. From a young age, Timothy worked in the stone quarries in the area, advancing to foreman and eventually superintendent of the Casparis Quarry before his death on May 15, 1913 from tuberculosis4. He was just 54. Two of their daughters, Ellen and Margaret also died of tuberculosis before their father; one in 1905 and the other in 1911. 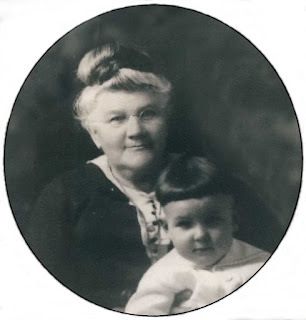 Mary Ann continued to live in the family home with her youngest surviving daughter who cared for her until February 18, 1930 when she died of heart problems at age 725. She is described by her descendents as a “typical Irish woman who demanded respect but loved children.” She had a wonderful sense of humor and could tell a good story. Mary Ann was deeply religious and belonged to several Catholic organizations. She passed her love of her Catholic faith on to her children. The third child of John and Ellen Burns Brown was Martha, born February 21, 1860 and baptized at St. Patrick’s on March 10, 18606. Like her brothers and sisters, Martha lived at the home of Aunt Martha, her mother’s sister, and Uncle Pete, on the quarry property after the death of her parents. On September 8, 1881, Martha married William Murnane7. William was a brother of Timothy Murnane, husband of Martha’s sister, Mary Ann. Martha and William had five daughters, Clara, Nellie, Julia, Margaret and Mary Cecilia. Both Nellie and Julia died by 1902, before reaching adulthood. far from where he lived. He was assigned to the No. 4 Truck Co., of the No. 10 Engine Co9. Note that other family members are also listed in the roster. James Brown, brother of Martha and Mary Ann, was also stationed at Engine House No. 10; and Charles Fleming was listed as a “sub.” Charles was a brother of Josephine and Hettie Fleming, wives of Thomas and James Brown. Information from the Central Ohio Fire Museum states that William was a substitute fireman and then a regular full time fireman. 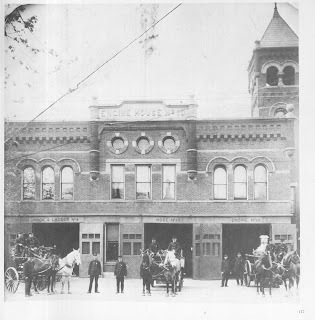 Regular pay for firemen around 1900 was $1,000 a year - payable once a year. Substitute firemen earned $2.50 a day10. They were paid daily. William was active with the fire station until his death on July 10, 1912 from heart disease11. Martha continued living in the family home until her death on September 6, 1914 from cancer12. She was just 54. All of the Brown brothers and sisters, except William Henry, and other Fleming and Murnane siblings and cousins, lived in close proximity on the west side of Columbus at one time or another. I remember stories of all of them visiting back and forth, especially on Sundays, and "discussing" who served the "best" meals. The children of John E. even stayed at "Aunt Mat's" (Martha Brown Murnane) when their house was quarantined for typhoid. Thomas Brown is the fifth child and third son of John and Ellen. (He is between James and David, both of whom were featured in the last post.) Thomas was born April 19, 1864 and baptized May 7, 1864 at St. Patrick’s in Columbus13. Thomas married Josephine Fleming on October 24, 188614. Josephine (Josie) is a sister of Hettie Fleming. Remember from the last post that Hettie married James Brown in 1883. Thomas and Josephine lived on the west side of Columbus until about 1895 where Thomas was a fireman for both the Columbus Fire Department and the “Insane Asylum15.” All three of their children, Mary, John D.16, and Josephine were born in Ohio. Thomas, like his brothers David and William Henry, inherited a wanderlust. The 1900 US Federal Census shows Thomas with Josephine and the three children living in Rochester, Minnesota. He was in a partnership with Frank More in a saloon business17. Thomas is back in Columbus in 191018; but, in 1920 he is living in Cut Bank Township, Bottineau County, North Dakota19. By 1930, Thomas again returned to the central Ohio area, where he owned property in Delaware County on High Street north of Powell Road. His mailing address was Westerville, but the property was directly north of Worthington where he worked as a night watchman at the Josephinium Pontifical College20. It is interesting to note that Thomas’ son, John D. was living in Bottineau County, North Dakota in the 1910 US Census; but, was back in Columbus by 1920. John’s daughter, Ruth, was born in North Dakota in 191621.
nephritis and was buried in St. Joseph’s Cemetery south of Columbus. Josephine survived Thomas nearly twenty years. She died in Columbus on June 12, 194923 at the age of 81. Ellen A. Brown is the eighth child and third daughter of John and Ellen. She was born September 23, 1869 and was baptized October 16, 1869 at St. Patrick’s24. Ellen, also known as Ella, Ellie and Nellie, never married. She lived with her aunt and uncle, Martha and Peter Burns after her parents died. From 1896 until 193925, when she was seventy years old, she worked at the state asylum, sometimes known as the “Imbecile Institute” and also as the “State Institution for the Feeble Minded” on West Broad Street in Columbus - the Hilltop area. Her occupation was given alternately as an attendant or a watchman. She probably resided at the institution since no other address is given for her in the Columbus City Directory until 1935 when she was living at the home of a niece. This was actually the home that had belonged to her sister, Mary Ann Murnane. The 1940 US Federal Census26 gives her residence as St. Francis Convent Home for the Aged in Tiffin, Chester Township, Seneca County, Ohio. The St. Francis Home began in 1869 as a home for orphans and older adults. It is still in operation today as a senior living center. I don’t know how long Nellie lived in Tiffin; she was living there in 1947 when her brother William Henry died in North Dakota. Sometime before 1960, Ellen returned to Columbus and was living at St. Raphael’s Home on December 2, 1960, where she died aged 9127. Descendants of Mary Ann who knew “Aunt Nellie,” described her as imposing and kind of quiet. She wore a straw hat and round glasses and reminded them of Grandma Moses. She is buried in Mt. Calvary Cemetery in the same plot with her parents. The next child is Julia Brown, born November 7, 1871 and baptized at St. Patrick’s on November 31, 1871. Julia died January 22, 187328 of “inflammation”, six months before her father was killed in the train accident. She was just over a year old. Although no stone marks her grave, she is buried in the family plot at Mt. Calvary Cemetery in Columbus, Ohio29. The youngest child born to John and Ellen Burns Brown was Peter. Peter was born on October 14, 1873, four months after his father was killed. He, too, was baptized at St. Patrick’s on December 6, 187330 and was just three and a half years of age when he was orphaned. Peter was raised by Uncle Peter, whom he was probably named after, and Aunt Martha Burns. Nothing is known of Peter’s life except that he died and was buried sometime in 1892 in the family plot in Mt. Calvary Cemetery31. A review of the death records in Franklin County does not identify him; so, presumably he died somewhere else and was returned to the family in Columbus. He could have been living out of town with an older sibling. There may be some notice in the local papers that would give more information. However, since no specific date is given, it will take awhile to do the search - something I intend to do sometime in the future. With the previous posts, that covers all of the children of John and Ellen Burns Brown with the exception of their oldest son, John E., who will be the subject of the next post. 2. “Ohio, County Marriages, 1789-2013,” database with images, FamilySearch (https://familysearch.org/ark:/61903/1:1:XZPB-88X : 8 December 2014), Timothy Murmane and Mary Ann Brown, 01 Apr 1875; citing Franklin, Ohio, United States, reference Vol 13, p 230; county courthouses, Ohio; FHL microfilm 285,147. 4. "Ohio, County Death Records, 1840-2001," database with images, FamilySearch(https://familysearch.org/ark:/61903/1:1:F6VL-T26 : 13 December 2014), Timothy Murnane, 15 May 1913; citing Death, Columbus, Franklin, Ohio, United States, source ID 1913 fn 1409, County courthouses, Ohio; FHL microfilm 2,032,528. 5. "Ohio, County Death Records, 1840-2001," database with images, FamilySearch(https://familysearch.org/ark:/61903/1:1:F6KD-LVV : 13 December 2014), Mary Ann Murname, 18 Feb 1930; citing Death, Columbus, Franklin, Ohio, United States, source ID 1930 fn 662, County courthouses, Ohio; FHL microfilm 2,032,729. 7. “Ohio, County Marriages, 1789-2013,” database with images, FamilySearch (https://familysearch.org/ark:/61903/1:1XZBG-QB4 : 8 December 2014), William Murnane and Martha A. Brown, 09 Sep 1881; citing Franklin, Ohio, United States, reference; county courthouses, Ohio; FHL microfilm 285,149. 9. Columbus Ohio Department of Public Safety Division of Fire, Fireman’s Register, Columbus Fire Department, 1899. Collection Catalog Number OVS 5578, Ohio History Connection, Columbus, Ohio. The Roster of 1899 lists all firemen employed by the city including substitutes. Martha’s brother, James, was also assigned to No. 10 Engine Co. This would have been just before James went into the saloon business with brother, David – also a subject of the last blog. Engine House No. 10 was constructed in 1897 and is still standing today. Photo is of Engine House No. 10 and was probably taken at the opening in 1897. Family members, William Murnane and James Brown are likely included in the photo. 10. Salary Information from the Central Ohio Fire Museum, Columbus, Ohio. 11. “Ohio, County Death Records, 1840-2001,” database with images, FamilySearch (https://familysearch.org/ark:/61903/1:1:F6KK-R51 : 13 December 2014), William Murnane, 10 Jul 1912; citing Death, Columbus, Franklin, Ohio, United States, source ID 912 fn 1728, County courthouses, Ohio; FHL microfilm 2,032,527. 12. “Ohio, County Death Records, 1840-2001,” database with images, FamilySearch (https://familysearch.org/ark:/61903/1:1:F6KL-P6J : 13 December 2014), Martha Murnane, 10 Sep 1914; citing Death, Columbus, Franklin, Ohio, United States, source ID 1914 fn 2487, County courthouses, Ohio, FHL microfilm 2,032,531. 14. “Ohio, County Marriages, 1789-2013,” database with images, FamilySearch (https://familysearch.org/ark:/61903/1:1:XZ5M-X98 : 8 December 2014), Thomas Brown and Josephine Fleming, 27 Oct 1886; citing Franklin, Ohio, United States, reference p548; county courthouses, Ohio; FHL microfilm 285,150. 15. Information for occupation and residences was taken from the Columbus City Directory, 1888 to 1895, available at Ancestry.com. 17. U.S. Federal Census, 1900, Rochester Ward 1, Olmsted, Minnesota; Roll: 779; Page 1B; Enumeration District: 0115; FHL microfilm: 1240779 available at Ancestry.com. Thomas’ partner, Frank More, was born in Illinois. The 1880 and 1910 census records show Frank More in McLean County, Illinois. This was the same area in Illinois where Patrick Brown, oldest son of John and Ellen Burns Brown, lived with his family. Could there be another connection with this part of the family in McLean County, Illinois? 18. U.S. Federal Census, 1910, Columbus, Ward 9, Franklin, Ohio; Roll: T624_1182; Page 3B; Enumeration District: 0142; FHL microfilm: 11375195 available at Ancestry.com. 19. U.S. Federal Census, 1920, Cut Bank, Bottineau, North Dakota; Roll T625_1331; Page: 2B; Enumeration District: 45, image 16B available at Ancestry.com. While this location was not far from where William Henry Brown was living in Mountrail County, the descendants of William Henry were not aware that William’s brother was living so close. 22. 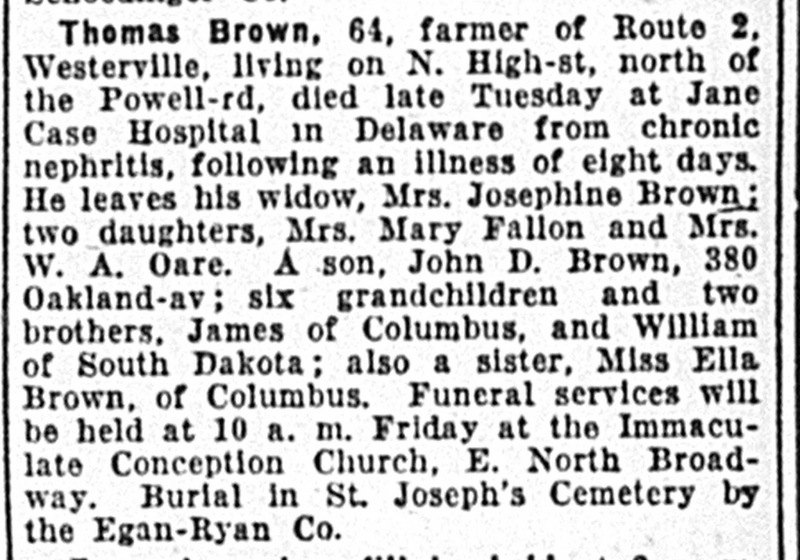 “Ohio Deaths, 1908-1953,” database with images, FamilySearch (https://familysearch.org/ark:/61903/1:1:X8QD-MDN : 8 December 2014), Thomas Brown, 05 Aug 1930; citing Delaware Twp, Delaware, Ohio, reference fn 47486; FHL microfilm 1,992,174. 23. 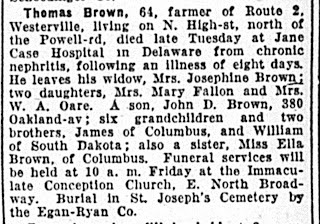 Ibid., Ohio Deaths, Josephine Brown, 12 Jun 1949; citing, reference certificate; FHL microfilm 2,247,091. 27. Columbus Evening Dispatch, Deaths and Funerals, 3 Dec 1960, page 2. 29. Catholic Cemeteries, Records from Mt. Calvary Cemetery, Columbus, Ohio.